BigRentz is all about getting involved in social causes and raising awareness of important issues. In October, some of the team participated in the Making Strides of Orange County walk, a fundraising charity that raises awareness for breast cancer. The team also exceeded their fundraising goal of $1,500 that was donated to the cause. Because October was focused on a women’s issue, it was only fitting for November to be about men’s health awareness. November is men’s health awareness month, nicknamed “Movember” by the Movember Foundation, a global charity centralized on saving and improving men’s lives. They focus specifically on the areas of prostate cancer, testicular cancer, and mental health and suicide prevention. Their efforts are supported by five million donors worldwide, and their goal is to reduce the number of premature male deaths by 25% by the year 2030. The BigRentz team was challenged to talk to all the men in their lives—husbands, fathers, brothers, and sons—about men’s health and to encourage them to get their annual checkups. They were also given specific steps that they or their loved ones could take to improve their health. These ideas to encourage more movement included taking a walking meeting, biking to work, taking the stairs instead of the elevator, and parking farther away to walk more. On a more lighthearted note, men on the BigRentz team participated in the Movember movement by growing mustaches throughout the month. 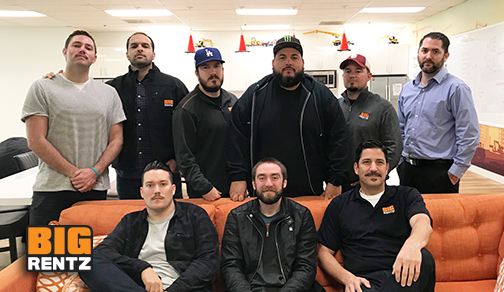 At the end of “no shave” November, each of the participants submitted a personal photo and all staff members were given the opportunity to vote on the best ‘stache. The pictures spurred some friendly competition and the email banter even included a circulating garden gnome with a bushy mustache who ended up receiving quite a few of the team members’ votes! Movember was an all-around success. Not only did the men on the team have a fun excuse to show off their facial hair, but everyone was made more aware of an important global issue and provided action steps to address it.